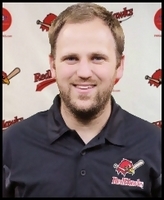 Michael Stark has been the Director of Stadium Operations with the RedHawks since 2015. He previously was a member of the gameday staff as an usher (2011), moving onto internship rolls in the organization with General Operations in 2012 and Stadium Operations in 2014. Outside of baseball, Stark enjoys many outdoor activities and spending time with family and friends. He currently lives in Moorhead, with his wife, Sarah.